Wearing dentures can be embarrassing. Sometimes they fall out or come loose. And you worry about it happening in public. Eating and talking can be a problem too. Because of pressure on your gums, conventional dentures also make the jawbone shrink away. This can give you a droopy mouth – making you look older. 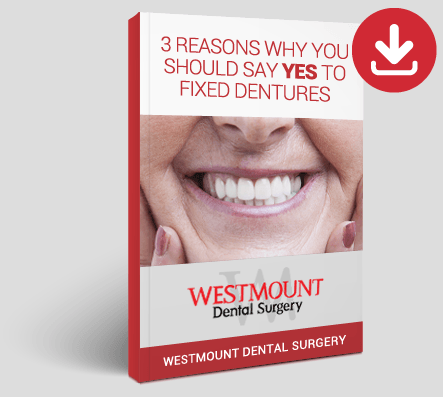 At Westmount Dental Surgery, our experienced dental technician can fix all these problems for you with comfortable, fixed dentures made especially for you. You could become one of many denture patients who say we’ve improved their quality of life. They’ve stopped covering their mouths with their hands. They SMILE more. Many say they no longer have problems speaking, and eating is much easier too. Book in for your FREE bespoke dentures consultation with our dental technician today. It’ll be a great opportunity to discuss all the options with you and give you all information you need before you make a decision on whether bespoke dentures are the right treatment option for you.